Different people have different ways of selecting tarot cards for a reading. I’m sure you’ve all seen the Gypsy or Wiccan woman on TV doing a reading and laying out multiple cards in a specific pattern. Not everyone does it that way. Some people use full spreads of cards, some use only two or three, and some use just one. When I do my daily readings I only select one card. Now, different people have different methods for doing this. I have my own, and when I’m focused, it works quite well. I take my deck in hand and focus on my intention. Usually I ask “give me guidance for the day” since I usually want something I can take action on that day that will bring positive results in the future. I shuffle the deck three times, then twist the deck in the middle (to invert some cards). I keep doing this until the deck feels charged. When it feels good, I move to step two. Next I split the deck into three piles. I slowly move my right hand over the piles to see which one gives me the strongest feeling. Usually it will be colder or warmer or more tingly than the others. I move my hand until one pile feels best, then I combine the other two piles and set them aside. 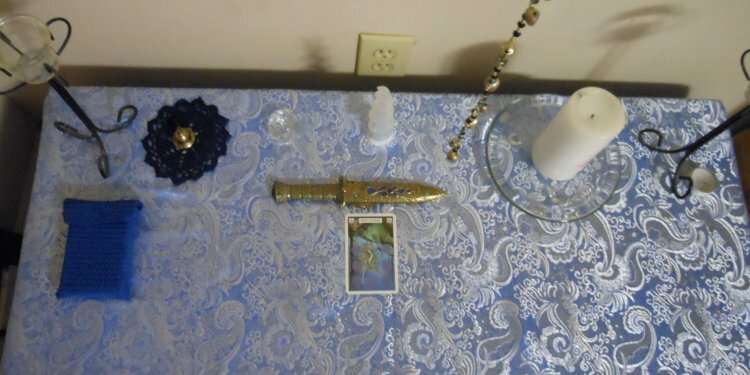 At this point I’ll spread the cards out across my altar so they have as much space between them as possible. I again move my right hand over the cards until one stands out. Most often I get a tingle at the back of my neck when I’ve found the right card. I do this, and the previous step, with my eyes closed, focusing on my intention. Once I get a feeling from a card, I place my finger down on it. Then I open my eyes, slide the card to the left, then flip it over to the right. I do this to maintain the orientation, either upright or inverted. I clear away the remaining cards and put them all back in the box. I made a case for my cards that keeps them protected when not in use. The card for my day is then placed in the center of the alter. I look at the image, then I go look up the meaning. Once I’ve looked up the meaning I take some time to think about what it says. I know that the interpretations aren’t always literal, so I go with my gut feeling of what I believe the card is trying to show me. I use this same process when I have other issues that i want assistance with. I’ve never used my cards to try to divine the future, and I don’t do readings for others. More than anything I use my tarot cards as a way to seek guidance for my day.